"NYCHS Presents Miskell's 'Why Auburn?' -- the Relationship of the City and the Prison preface"
The high walls of Auburn Prison have been a familiar sight to Auburnians since 1817. Locals are aware that the prison has not only provided employment for many down through the years but also has been the object of reformers and the subject of much excitement during different periods of its long history. "Why is there a prison located in the middle of a city?" "What does the existence of a prison mean economically to Auburn today?" The War of 1812 was called "Madison's War" by Federalist critics of President James Madison (whose image above is from one on the White House web site). The war was fought over the British seizing American ships on the high seas, and forcing American seamen to join the British navy or merchant navy. America's navy was unprepared for the war, having only a few good frigates, including the Constitution, "Old Ironsides." Nevertheless, the U.S. Navy and American privateers together captured 30,000 British prisoners, while the American army captured 6,000. Some of those POWs were held at a camp that later became the site for Auburn prison. After the War of 1812, Auburn was legally incorporated as a village by the New York State Legislature on the 18th day of April, 1815. Auburn then contained about 200 buildings and 1,000 inhabitants. There were 30 stores and six taverns, five saw mills and four grist mills. Additionally there were three tanneries, three distilleries, two watchmakers and a variety of merchants, shoemakers, wagon makers, saddle makers, chair makers, tailors and lawyers. Auburn was the largest village in central or western New York. Rochester and Syracuse had not yet been incorporated as villages; Buffalo, Geneva and Canandaigua were behind the "loveliest village" in population and general business activity. Auburn was definitely a village on the move; the business prosperity seemed unstoppable. The first board of trustees of the new village assumed the duties of putting the government into operation. Protection of the village from fire and improvement of the streets and walks were among their first official acts. The trustees then began to explore ways of expanding business in the community. They looked for help from the State Legislature. In 1816 the government of the State was in the hands of the Democrats. Cayuga County had gone Democratic by a sizeable majority in the latest election and Village fathers wanted a reward. They wanted a new industry that would confer importance and prosperity here. For some years prior to the incorporation of Auburn as a village, the Legislature had been considering a proposition to erect a new prison in western New York. The people of Auburn wanted to have the prison built in their village, believing that it would stimulate business as well as promote land sales. The unsuccessful presidential candidate against James Madison in 1812 was DeWitt Clinton (sketch above). In his long career, he served as state senator, U.S. senator, New York City mayor, lieutenant governor, and governor, the latter being an office once held by his uncle, George Clinton. 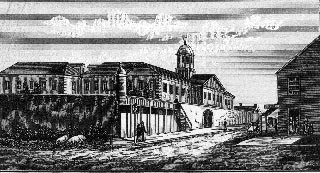 the year (1822) the workshops were rebuilt. the year (1828) Newgate closed. The prison system of New York State began in 1797 with the erection in the City of New York of Newgate Prison. It was a new and uncertain business; no one quite knew what to do. For countless centuries convicted criminals had been punished by either corporal punishment or fines, and until the close of the Revolutionary War, crime in the colonies was punished by the lash, branding, the stocks, and various other forms of punishment other than confinement. Sixteen heinous crimes were punishable by death, reduced to two after the Revolutionary War. All punishments were done in public. Humanitarians throughout the colonies protested these barbarous methods of punishment which were an inheritance from the cruel statutes of England. The substitution of confinement as punishment for the commission of criminal acts was considered to be superior to the corporal punishments of the past. It was the first prison in New York State and second prison in the United States. It opened on November 28, 1797. It was located on what then was Amos Street in Greenwich Village and was named after the famous London Newgate. The prison was a two-story structure about 200 feet long built on a $20,000 site at a cost of $178,322.45. It provided dormitory rooms for prisoners both male and female and workshops. Newgate was vacated on May 12, 1828 after Auburn (1817) and Sing Sing (1825) were opened. The old prison building was demolished in 1845 and its site is occupied by an industrial building erected in 1937 on what is now West Tenth Street. The site is marked by a bronze plaque erected in 1939, by the State Education Department. Confinement in prison began with the humane idea of treating criminals as human beings, not as animals. This philosophy was opposed by many traditionalists who had no faith in a system designed to change a person's attitudes and behavior. There were those who espoused cruelty rather than compassion and the humane idea, although never lost entirely, was soon overshadowed by the financial costs of an unprofitable operation. Newgate prison did not serve as a deterrent to crime. Overcrowding soon became a serious problem. Newgate had been designed to accommodate less than 450 prisoners but soon held twice as many. By 1808 it was recognized that Newgate was a failure but not until several years later did a legislative bill appropriate sums of money for the construction of a state prison similar to Newgate. If confinement was the answer, facilities for confinement had to be increased.